George Goehl brings over three decades of creative design to the Brown County Craft Gallery with his decorative metal designs. 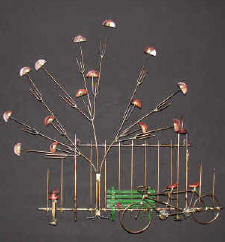 Sculptures of copper, brass, bronze and combinations of non-ferrous metals have been formed into freestanding objects or pieces to be hung on the wall. An interest in metal working first sparked Goehl’s artistic skills and he set out to learn the craft and put his own stamp on it. 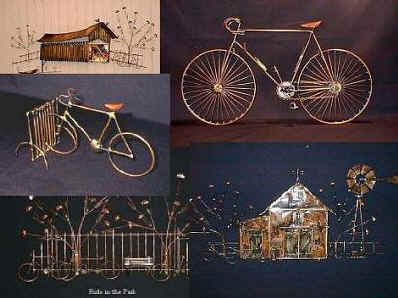 A graduate of Ohio State University with degree in anthropology and a master’s in education, Goehl is a self-taught artist known for his Americana, pastoral, bicycles and golf pieces. The Magic Wands of George Goehl have been featured on an Indianapolis TV station. These one-of-a-kind designs are made in a combination of copper and navel bronze with aluminum wire wrap on the handle. Each wand, available in two sizes, comes with Goehl’s own recipe for bubble solution. A large selection of wands, in addition to a large variety of his other work, is always available at the Brown County Craft Gallery.